RJ Schinner is pleased to announce a new partnership with Kimberly Clark Professional. We are equally excited to offer their products to our Distributor Partners. Kimberly Clark is a leader in the Health & Wellness as well as Safety & Industrial markets, and we are excited to bring those brands to you. 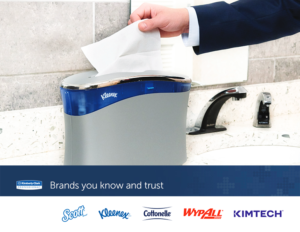 Kimberly Clark has a wealth of global brands that consumers know and trust, including Kleenex, Cottonelle, Scott, WypAll and Kimtech. One in four people use their products everyday, they are known in over 80 countries and they have been an industry leader for over 145 years! It’s a simple, yet powerful mantra that guides us at Kimberly-Clark Professional. Whether in our own facilities or yours, it means developing innovative products to eliminate germs in the workplace – and implementing the best programs to use those solutions. But, to you, it simply means we have your best interests in mind. For more information on ordering Kimberly Clark, or to view products and pricing, please visit RJ Schinner’s website or contact your local Sales or Customer Service Representative. More information is also available on the Kimberly Clark literature page, here on the Blog. The RJ Schinner focused catalog can be found directly by clicking here, it will outline the newest Kimberly Clark products available through RJ Schinner. We look forward to servicing your Kimberly Clark needs!